This account was first published in the Nauvoo Neighbor in its May 7 and May 14, 1845 issues. 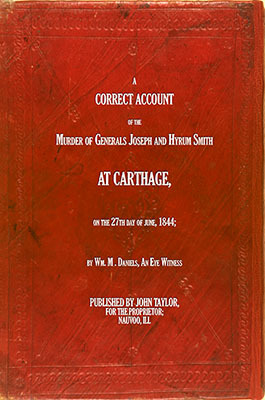 William Daniels was a key prosecution witness and the publication of his account a few weeks before Carthage Conspiracy trial was a great benefit to the defense, who used it extensively to impeach Daniels during cross-examination. 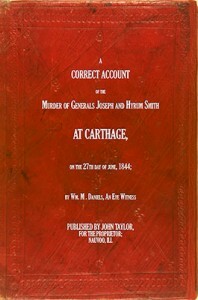 The account contains several embellishments or fantasies that are contradicted by other witnesses. For example, Daniels has Joseph Smith surviving his fall from the second story jail and then being shot by four men under the orders of Levi Williams. After the murder of Smith, Daniels describes a scene in which a “ruffian” draws a bowie knife and is ready to sever the head of Smith when suddenly a pillar of light “bursts from the heavens upon the bloody scene” and frightens the killers away.